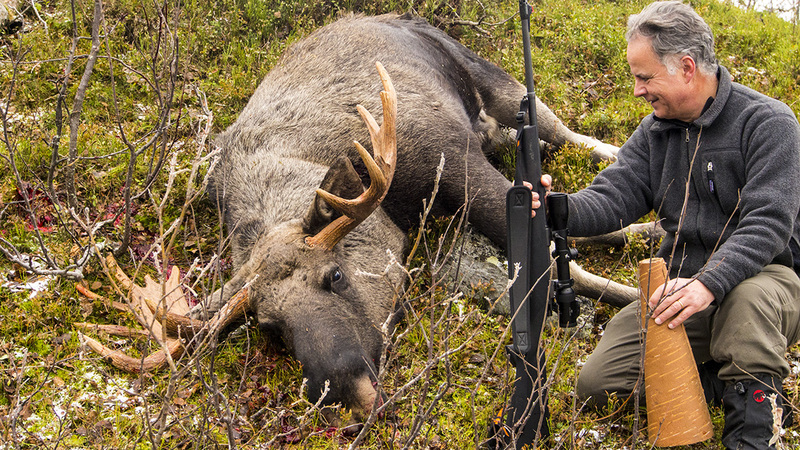 Hunting in the mountains with Tommy and the Nordguide team is most probably the ultimate experience in moose-hunting. The adventure starts in Lulea, when you board the helicopter, full of food, guns, ammunition and many other things! The flight takes close to one hour and progressively, you see no road any more, houses get rarer and you start realizing that you will be very far away from civilisation! The camp is a wonderful place! just a few houses, a sauna, endless forests, rivers, lakes, mountains and an amazing wildlife! What strikes you is that you are in completely untouched nature! The house where we stayed is a typical swedish house! Wood-heating both in the kitchen and in the rooms and very comfortable beds! If you want to wash yourself, the sauna is the best alternative and the river nearby (2° centigrades…) is waiting for you! Dinners in the camp are wonderful moments! Tommy is a great cook and proved to us that you can prepare a chateaubriand with foie gras on a wood-oven! Of course with a great bottle of wine! And late in the night, while checking the weather of next day, watch for the aurora borealis transforming the sky in an amazing piece of art…! Going in the forest with Tommy or one of his friends is an incredible experience. You learn to read all the signs which will finally get you to a moose. You will walk through deep forests, sometimes disturbing a capercaillie, calling for bulls on regular intervals, waiting in fabulous places surrounded by the magic of swedish Lapland. Colors vary from the yellow of the birches, the green of the pines,the white of snow-covered mountains and the blue of the sky! Make sure to be fit, because Tommy is going to take you on the top of some mountains, where there is no path, jumping from one block of granite to the other! But do not be afraid! One of his great qualities, is to adapt the program to your wishes and to your condition! So no worry, if you want a quiet day, Tommy will take you fishing in the lake, spend a few hours in one of the magic places he knows about, calling for bulls during a few hours and lighting up a small fire to brew some tea or coffee! The last day, after a serious mountain-climbing experience, we had the chance to spot the large bull we had been hoping for during the last four days! Tommy’s calling must have proved convincing and I finally got a chance to shoot. After one hour of hard work, we left the moose until the helicopter could pick it up the next day and walked back light-hearted through the forest to the house where another great dinner waited for us to celebrate the success! And when the helicopter takes you back to Lulea, you know two things for sure: this is not your last hunting experience with Tommy and you will come back to Swedish Lapland!